Tuscany: the best way to navigate? I'm having hard time completing my first time trip Italy itinerary. We (2 adults + our son 10 y.o) are spending first 5 days in Rome. The remaining 3-4 nights I'm planning to spend in Tuscany with perhaps 2 nights in Florence. We're traveling in 2nd half of April. The problem I'm having is mainly with logistics. I understand that the best way to navigate Tuscany is by car. 1. Is it better to take a train out of Rome to e.g. Sienna, rent a car there for 2 days in Tuscany, return it, and then take a train to Florence? Or, just drive from Rome via 2 days Tuscany to Florence? Is Florence really that bad in terms of traffic, even if just driving to and returning the car in a city location? 2. Best base in Tuscany. We'd like to spend 2 nights in the same hotel. I'm thinking of a relatively large town with a few things to do especially with a kid. Sienna seems to fit this. Is it doable to drive from Sienna to Pisa and back in one day at a leasurely pace perhaps stopping by in smaller towns? Also what's the best (hassle-free) way to get from Sienna to Florence assuming we're not driving there? As we won't be rushing through as many towns as possible I'm already seeing that it's not going to be a problem to choose the towns in Tuscany to visit. Sure, we'll skip a few must-sees, the main goal is to get the idea of the Tuscany ambiance, plus perhaps a visit to Pisa tower, a must for my son. 3. Flying out. I'm planning to do an open-jaw trip. Originally, flying out of Florence to NYC. I just realized that there is another option - flying out of Pisa. So if we happen to get better deal from Pisa would it make sense to get to Florence from Rome first for two nights and then complete our trip with 2 nights in Tuscany? Which airport of the two Tuscany ones is preferred in terms of ease of getting there and general user-friendliness? One other thing: we're coming back on the Easter weekend, on Sa. or Sunday. Any special considerations? 2-4 buses an hour link Siena (one n) to Florence and cost just a few euros. san Gimignano, one of Tuscany's finest proverbial hill towns and one known for its forest of tall slender towers, originally built the story goes to escape not only the rabble but the plague - on the way to Pisa though unless you have booked a time to ascend the Leaning Tower you could wait literally hours in line - especially the week before and after Easter - one of the most hectic tourist times in Italy. If you do not want to get a car be sure that you can easily take buses between the more popular hill towns - Tuscany has a dense bus system and then you have no parking problems as you may during that hectic week and since buses are dirt cheap save money. Or you could just base in Florence and take buses to any of several great hill towns - Siena a largish hill town but IMO one of the finest cities in Italy - or San Gimignano or farther afield Montepulciano (bus from Chiusi train station is one surefire route with hourly buses up to one of Tuscany's most popular hill towns. Or from Florence day trip by train to Umbrian hill towns like Assisi or Perugia, etc. Or base yes in Siena and use the bus or train to day trip - easily done and no car to worry about. the idea of driving around to dreamy hill towns IMO is often more romantic than it turns out to be - especially at that time of year and IME the roads are sinuous, etc. personally, I'd find a town or an agritorismo that I liked the look of, and make that my base for the entire 4 nights - moving another 2 times is a lot with a small child. Florence is the least child friendly of the "big three" and if you've just spent 5 days in Rome, IMHO a contrast is what is required. as discussed here a little while ago, Pisa itself is a very pleasant place when the tourists have all gone, and once you are there, makes a good base for trips to Florence and Lucca. San Gim is also nice when the coaches have left. but I would rather be in the country. Yup book any accommodation really far in advance during that hectic time - especially the dreamy Agritourismo places like annhig mentions - i think those are special places from which to really drink up the Tuscany countryside and with a car limit your trips to nearby towns as really driving can take much longer IME than you imagine in this hilly area with side roads. I haven't thought about exploring Tuscany entirely by bus or train. The way you described it does sound doable, and relieves me of a lot of headache from driving/parking. So would Siena be a good base? Are just the major Tuscany towns reachable by bus? For example, is there a bus to a smaller town of Volterra which is often referred as one of worthwhile destinations? We'd probably prefer a small town to stay vs. countryside, with a fortress-like appeal of the towns and having more things to do at night with a kid. I do like the idea of staying the entire 4 days outside of Florence. Perhaps a day trip to Florence may be sufficient. Wouldn't Pisa be a little far from Siena and other towns of central Tuscany? great! thank you for a prompt response. should have said San gimignano is a short bus ride from siena - lots of buses. Siena is a big town but one that i love and IMO if not looking for that proverbial sleepy Tuscan hill town it makes a perfect base, what with its excellent bus and train links. You can also take a train from Siena to San Gimignano but the S gimi train station is about six miles from town and buses meet trains to take you up to the hill town. Just realized that center of Siena is not accessable by car. I guess it makes it a problematic spot for a Tuscany base if plan to travel by car. Especially if the hotel is inside the walled city which I understand most of them are. Look at Santa Caterina and Palazzo Ravizza. Both are excellent and have parking available. Or, consider Montepulciano---a town of about 10K---and lots of good eating options. Check out Politian apartments for a bargain. thank you. The hotel reviews look good. Unfortunately they're not available on my dates but I do see that there are other possibilities with a car in Siena, e.g. staying just outside city walls. Or even staying inside and arriving by bus/train and then renting a car and parking it outside. At this point I'm planning to stay in Siena for 2 or 3 nights, and then going closer to Pisa airport, staying either in Pisa or Lucca for the remaining 1-2 nights before my flight. Lucca IMO is a dream town rivalled by few in Italy - walls all around and an ungodly number of old towers, etc. Lucca has lots of trains to Pisa and connections by rail to Pisa Airport. And if going to the Leaning Tower you can take a train from Lucca in a few minutes to Pisa San Leandro (sp?) station that is a short walk from the Leaning Tower. There's a LOT more to see and do IN Siena than in Lucca IMO and if your kid can stand it, stay out in the countryside. The train station in Pisa closest to the Leaning Tower is Pisa San Rossore. 3-4 days in countryside will probably be too much for my kid. The walls and other structures of Siena would get him more excited. On the other hand, there seems to be a couple of agriturismos just near Siena, like agriturismo Marciano for example. So perhaps we could combine the best of the two worlds. I did decide to drive to the countryside a little bit incl. travel to Lucca. Just rented a car from Siena to Pisa, picking it up on day 2 in Siena after we arrive by bus. Lucca does look exciting from the reviews. I'm assuming full day should be enough to explore it. razuzin, your son may enjoy the story of Siena's Palio and how the city's neighborhoods/contrade have their own teams, flags, colors and "mascots." 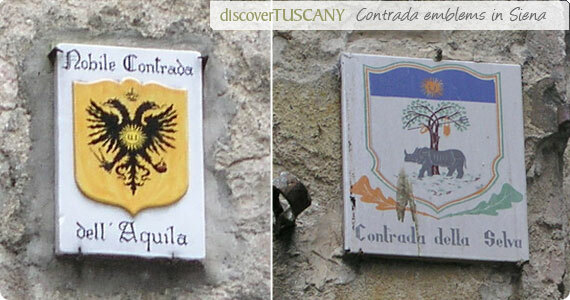 As you walk around the town, you'll see each contrada's flag and occasionally its emblem on buildings. Your son can pick "his" neighborhood.